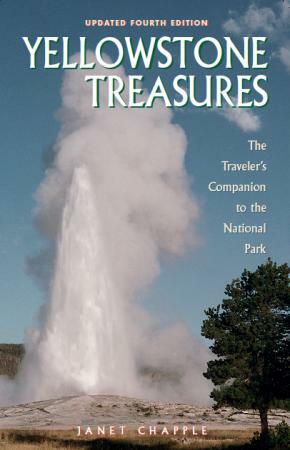 Please make Yellowstone Treasures available for international customers through iBooks/iTunes. I love the book, but books are heavy so I would like to have it with me as an ebook when I travel to the US and Yellowstone later this year. When trying to buy it in the iTunes store I am told I need an American account to buy it. Other ways I can get the pdf or epub? I’d like to share our correspondence, edited for length, so everyone knows people around the world can now easily get the Yellowstone Treasures ebook. I’m sorry you are having trouble obtaining Yellowstone Treasures as an ebook from outside North America. The problem is that I had only officially granted US and Canadian rights to my distributor. I will add you to the e-newsletter list and try to notify you as soon as the pdf and other versions are available to the rest of the world. The distributor says they are changing this! I’m so glad to hear you enjoy the guidebook. Today I see that you should be able to buy it in pdf or epub format now, because the listing says World rights. You can buy the ebook on our distributor’s website. If you want to read it on an iPad, you will need to download the free Bluefire Reader app. Or if you prefer, you can try finding it in iTunes, but I am not sure if the book is available there yet. I am now the very happy reader of Yellowstone Treasures on my mobile phone and tablet (iPhone/iPad)! I would recommend the pdf version, not the epub, because of poor image quality in the epub. Pictures in the epub are blurry when enlarged (when you zoom in) and on a small device, you need to be able to zoom in on the details in the maps. This is not an issue with the pdf. I have written Terry at IPG about this and a couple of other things. I really appreciate that you and IPG are making digital versions available. I’ve also written National Geographic about the same thing, and only received a “sorry we don’t have our guidebooks available in digital formats” reply. Those books will be left at home even though I would have really liked to have them with me on my trip later this year. Get a free copy of “Yellowstone Treasures”! Comments Off on Get a free copy of “Yellowstone Treasures”! Here’s your chance to get a free signed copy of my popular guidebook! and take a chance on receiving a free book. 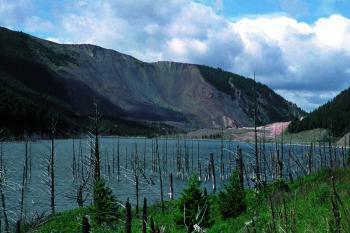 It will help you plan for your next trip to Yellowstone Park and enjoy the park to the utmost while you’re there. But hurry, the sale ends this Friday, January 8, 2016, at midnight. For the second printing of Yellowstone Treasures, updated fourth edition, we made a few changes. A big one is the paper itself, which is now FSC-certified. This means the paper has been sourced in an environmentally-friendly, socially responsible, and economically viable manner. Below is our Facebook post about this milestone. Over the next few weeks we will let you know about other improvements, which are so numerous we decided to add “Newly revised in 2015” to the title page. On this date we received the new printing of Yellowstone Treasures, 4th ed., in our warehouse. For the first time our printer, C & C Joint Printing, had Forest Stewardship Council (FSC) certified paper available for the guidebook. We are pleased that the paper and cover are from post-consumer waste, reclaimed wood, and/or controlled forests. Summer sale on Visiting Geyserland ebook! Comments Off on Summer sale on Visiting Geyserland ebook! 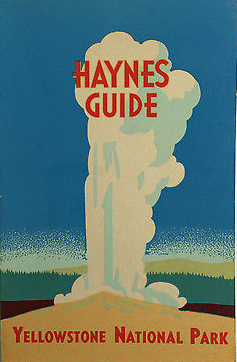 We recently improved Visiting Geyserland, adding more direct links to the geyser routes and maps. 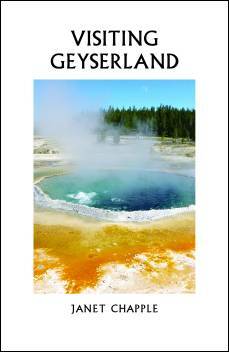 Visiting Geyserland is our guide to the geysers and hot springs in the ten Yellowstone geyser basins and other hydrothermal areas convenient to the roads. It’s handy to have the geyser walks at your fingertips on your phone or tablet when you are in Yellowstone. You can zoom in close to the maps and use the hyperlinks to jump to the correct section of the trails as you choose to follow them. All summer we are offering this short ebook at $4.99, discounted from the list price of $8.49. The Buy now button on the Visiting Geyserland page takes you to our distributor IPG, where you can choose the format that works for you: ePub, Kindle, or PDF. Might be a good way to introduce a friend to Yellowstone Treasures! 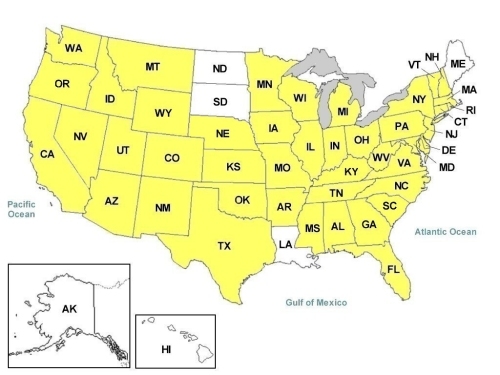 The U.S. states colored yellow in the map are those where at least one person has ordered a book directly from this website as of December 2014. Site visitors from Germany and the United Kingdom have also bought the book. Is your state white on the map? Of course, in those states people chose to buy the book at their favorite online or local bookstore instead of from our site. Yellowstone National Park visitors can find the book at the park’s visitor centers, Delaware North general stores, and some of the hotel gift shops. But hurry, the sale ends this Saturday, January 10, 2015, at midnight. Credit: NPS photo of Grotto Fountain Geyser by Jim Peaco, July 2001. Janet Chapple’s new e-book of geyser basin walking tours of Yellowstone National Park is now available from Amazon, Apple iTunes, Barnes & Noble, eBooks.com, and more . 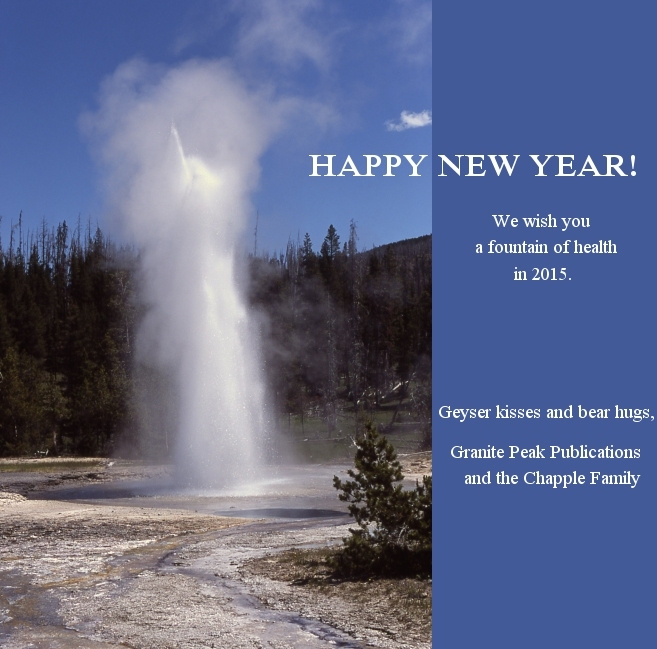 . .
Post by Granite Peak Publications.